Neither saint seems responsible for the traditional rites and rituals of Valentine’s Day. Various “legends,” such as that of an imprisoned Valentine sending his true love a note (signed: “Your Valentine”) before his martyrdom, are evidently rather recent fabrications, no older than the late 18th century. The traditional Roman fertility feast of Lupercalia was celebrated in mid-February. Lupercalia featured games and races, and included throngs of athletic youths running naked through the streets of Rome, lashing at the objects of their attention with thongs. For some reason, this was thought to promote fertility. Lupercale was also a time for lovers to announce their engagement. The possible connection with the Lupercale seems to me to be the best reason that this day is so long associated with Romantic Love, though many authorities question this. There is really no documentary evidence available, and Chaucer’s assertion quoted above appears to be the first written association of the Day with couplings of any sort. By the high Medieval period, written expressions of love were an integral part of Saint Valentine’s day, and the exchange of gifts was well established. The earliest surviving example of a “Valentine” is a letter dated 1416 written by the Duc D’Orleans to his wife when he was imprisoned in the Tower of London following the Battle of Agincourt. By the early 1800s, note cards especially printed with love poems and pretty images became popular, helping to give rise to the Greeting Card Industry of today. In the middle Nineteenth Century, sarcastic and even insulting cards became a fad. Flowers and sweets were certainly associated with the Lupercale, and there is possible reason to conclude that these traditions of our modern Valentine’s Day celebration are direct descendants of the Roman customs. The iconic image of the cockled (“heart shaped”) heart seems to stem from antiquity; some trace it to Aristotle’s anatomical descriptions, but the design certainly is far older than Hellenic Greece. It is true that the “heart” figure barely resembles the actual human organ, though the two upper lobes have a plausible correspondence to the right and left atria, yet it seems a rather long stretch. It is really rather tough to explain the imagery of the “heart.” Anthropologist Desmond Morris even speculated that it represents a simplified rendering of the female form posed in sexual receptivity. In any case, it is an ancient figure. In modern times. 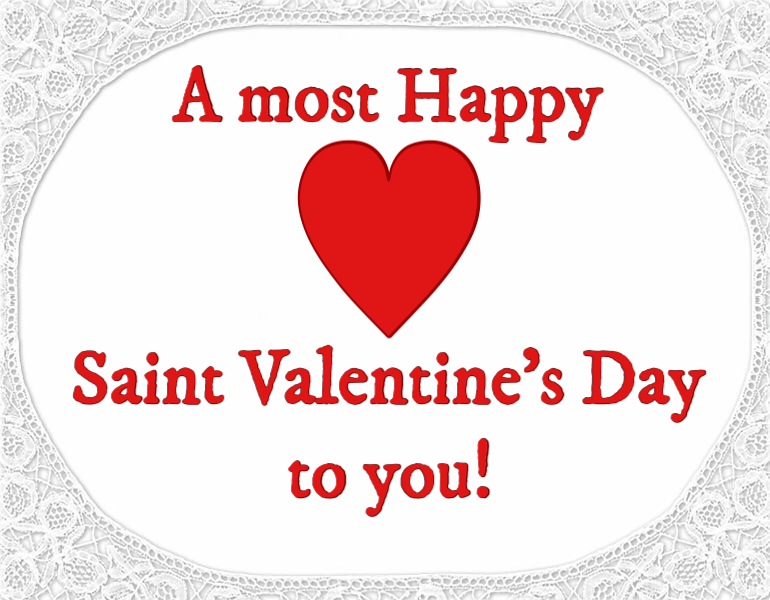 Saint Valentine’s Day is a commercial bonanza: it is typically the highest single-day sales volume for florists, and it is the number two greeting card holiday, second only to Christmas. Candy sales have fallen off somewhat in recent years, perhaps due to a trend for healthier lifestyles, yet they still remain huge. No matter its origins, Valentine’s Day remains an enduring favorite. Several weeks after the Christmas and New Year’s holidays, yet still in the grip of cold, grey, and often depressing winter, people are undoubtedly ready for some good excuse to have a celebration, and why not celebrate Love amid the dreary days? God would not have bound even the divine with love. This entry was posted in On This Day and tagged Valentine's Day by Jamie Rawson. Bookmark the permalink. I love reading your blogs. Thank you. I’m going to use the quote from Carmina Burana. Thank you! I shall keep `em coming!